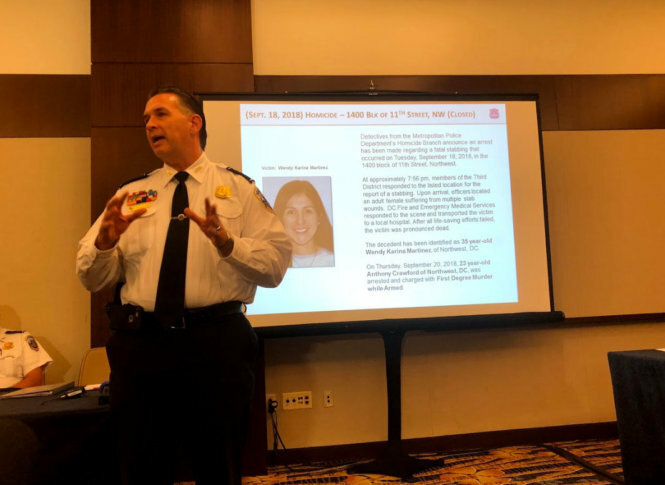 Dozens of people who live near D.C.'s Logan Circle crammed into a meeting room Monday night to talk about a crime that has left the neighborhood on edge: the fatal stabbing of runner Wendy Martinez. WASHINGTON — On a rainy Monday night, dozens of people who live near D.C.’s Logan Circle crammed into a meeting room to talk about a crime that has left the neighborhood on edge. Last Tuesday night, 35-year-old Wendy Martinez, an avid runner, was out exercising when D.C. police said 23-year-old Anthony Crawford stabbed and killed her in what appears to be a random attack. “I wish I had a better explanation for you about why this happened, but I don’t,” D.C. police Chief Peter Newsham said. He did address some of the speculation surrounding the case: Right now, no evidence points to this killing being a possible hate crime, he said. Also, according to court records, a witness told police that Crawford was a user of the dangerous synthetic cannabinoid K2. Newsham said, so far, “it is a stretch” to connect the violent murder to drug use. The murder has rocked the Logan Circle neighborhood, said John Fanning, from Advisory Neighborhood Commission 2F, who represents the area. “It feared a lot of folks that come visit the neighborhood, current residents — some of them weren’t going jogging,” Fanning said. In the packed meeting room, residents voiced concerns over what they have been seeing in the neighborhood. One woman told a story of being held at knife point. Others told of sightings of possible prostitutes working in the area. Newsham said a recent prostitution sting in the area led to the arrest of several customers, and that overall crime is down in the neighborhood. “This part of the city is a very, very, safe part of Washington, D.C. I know it is hard to hear me say that after what we all experienced at 11th and P streets the other day,” Newsham said. According to police data, Martinez’s killing is the only one to have taken place in the neighborhood this year. Last year, the neighborhood saw no murders. Some residents said what took place has resulted in them questioning their safety walking alone and during the night. Resident Dale Greenwalt said after Martinez’s killing, his wife began taking taxis to the Metro station instead of walking. “She leaves at 5:30 in the morning; its just too long of a walk in the dark,” Greenwalt said. Some of the ideas from residents included doing more to address the drug problem in the city; others suggested putting more police patrols on the streets, especially at night. D.C. Council member Jack Evans, who represents Ward 2, said the city needed to hire more officers, and he urged residents to express their desire to see that with other city lawmakers. “We need more police, we need more visibility, if only because it makes people feel safer,” Evans said.